Hope you are well. 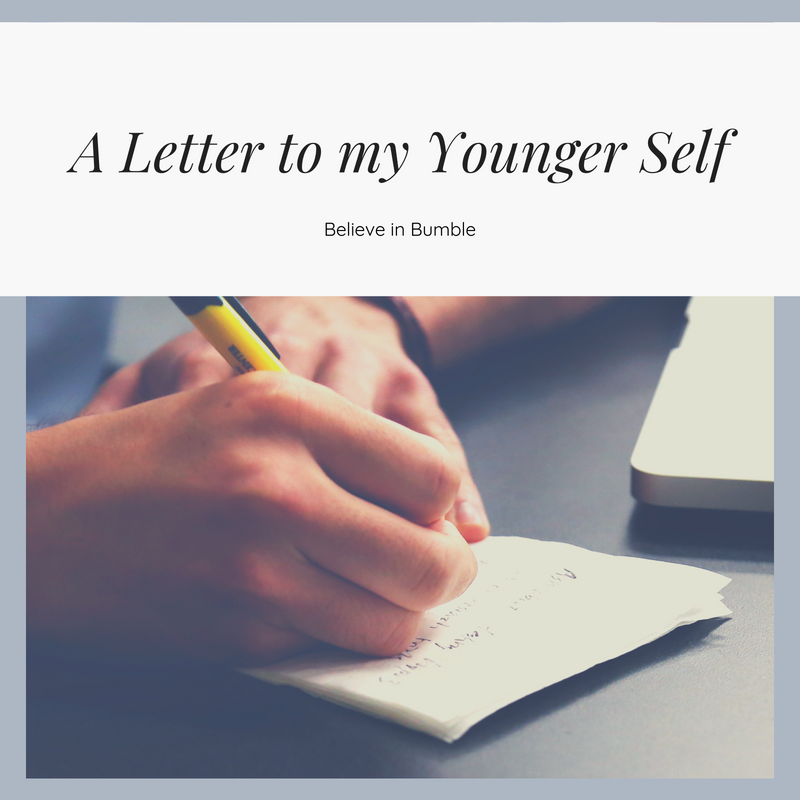 I wanted to write you a letter, partly to show you how far you have come and also as a helpful reminder to myself. Looking back you had a positive childhood with many highlights such as winning a distinction medal in dance, convincing your little sister you had magical powers, summers spent exploring your hometown and lots of family days out. You also had some struggles, you were always an anxious child. This got worse in your teens and sadly lead to an eating disorder. I still remember how I felt then, all consumed in food and exercise. Panicking about the food at social events, attending Food Fridays Psychology class late to avoid confronting food, watching endless cooking shows and waking up at 5 am to exercise before school. During this time you learnt that being strong is not the same as being quiet. I know you struggle to ask for help but you have so much support around you just reach out to someone. It doesn’t make you weak. It allows you to build relationships with people. Make sure you thank your Psychology teacher as often as you can, after you reached out to her she took time out of her schedule every week just to talk to you and give you advice. She played a key part in your recovery. You did have the guts to go and see a doctor and well done for that! Sadly the medical profession was not as clued up on mental health as they are now so they turned you away. I know how much that hurt but don’t forget you still have people around who want to help you. Also, don’t worry when you go to the doctors in the future they will a lot more helpful. You now know that being mentally healthy is just as important as being physically healthy. At the end of the day clothes sizes are just a number, so what if you, not a size 8, that’s ok. Instead, eat healthily, exercise regularly and your body will find its natural weight. Though being anxious is difficult it does have its positives. Being anxious makes you hyper-aware of how other people are feeling and makes you want to take care of them so they don’t feel the way you do. Remember when you used to play nurse every time your sister was sick. This also is part of the reason you go on to university to study Psychology and HR as you want to have a positive influence on someone’s life and protect from feeling the way you did. Just remember to protect and care for yourself first. You need to look after yourself so you can look after others (you still struggle with this but you are getting better). Be comfortable being an introvert. It doesn’t mean your shy it just means you need to make sure you have time alone to recharge. Learn to trust your gut as it is usually right! You were very good at being true to yourself when you were younger. I admire that about you now. You still are but it takes more effort than it used too. Along trusting yourself, don’t let your friendship group determine who you are instead, let who you determine your friendship group. I know you had a lot of fun hanging out with your friends but make time for family as well. Friends may come and go but family will always be there. In some ways your eating disorder helped with this as you were always too scared to eat someone else’s cooking so would always be home in the evening to cook dinner. I treasure those memories of eating home cooked food as a family. On the note of family, your parents aren’t perfect they are human beings so be empathetic with them. They are only trying their best. You will get to see the more human side of them as you get older and it will make you love them more than you do now. I know you struggled to ask your parents for advice as you wanted to seem strong and independent but they were once young too lean on them for advice. One of your favourite memories with your Dad is when he came to visit you at University and you sat in the pub discussing your relationship and getting advice from Dad. I know the idea of discussing relationships with your Dad seems strange now but trust me. Don’t take living at home for granted! You permanently move out of home quicker than you expected. You always thought you would move back home after University but instead you meet your boyfriend, get a job in London and move into a flat in London. I know you, the girl who grew up in a small town and went to University in a small town now lives in London! You do love living with your boyfriend and exploring London. Treasure the time you get to visit your family as in a way that will always be home. You have come a long way in your twenty-two years. You still have some figuring out to do but that’s ok you are still young! You are currently battling depression but you know you will get through it like you got through your eating disorder. Hindsight is a wonderful thing but all your experience has shaped you into who you are now. She is pretty awesome! This was a lovely post and you should be so proud of how far you have come! I too have suffered from mental health issues growing up and into adulthood. This was a lovely idea and one I think I may try over on my blog. Hello Jess, Thank you for writing such a lovely comment. It really means alot too me! I look forward to reading your letter.